I really like style of this ceiling fan/light. It is going in our mountain retreat Great Room. Although it is rated for outdoor use, I couldn’t find anything else that really suited this space any better. As soon as it is up, I will update this review. I would recommend this item. This 60-inch, 5 blade ceiling fan from the Lyndon Patio collection features a distressed black finish that will subtly highlight the existing décor in your home. This attractive fan will complement many transitional decors. 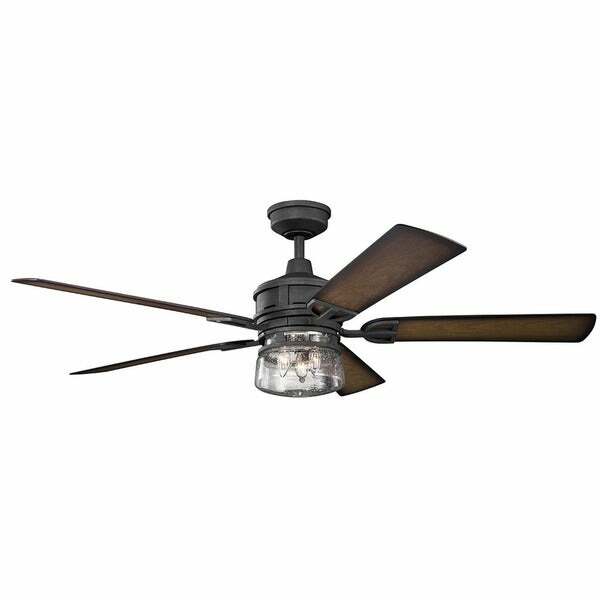 This Lyndon Patio ceiling fan features a sleek, nautical style and clear seeded glass. The 5 blades are pitched 13 degrees and are reversible with your choice of a walnut or walnut shadowed finish. The 188MM X 20MM Motor will provide the quiet power you need. This fan comes complete with a 3 Speed Wall Control Limited Function System. Dimensions: 19 inches high x 60 inch diameter. Turn on our fixtures, and watch your room transform even more. 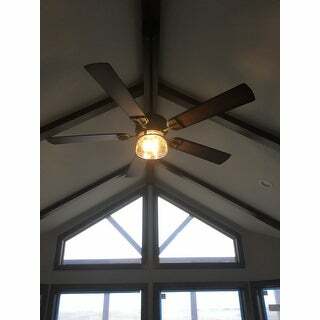 From lighting to ceiling fans Kichler collections are built around our simple philosophy of bringing you the effect you want for your home or business. Our collections coordinate from room-to-room, or let you mix and match from wall-to-ceiling. And each fixture is designed to deliver a stunning quality of light that makes your space more beautiful and more livable. As one of the largest, privately held residential lighting fixture companies in North America, we're constantly working to create innovative and on-trend decorative products as well as knowledgeable support. Since 1938, we've been creating products that are not only well designed, but also practical. We invest millions of dollars each year in design, technology and testing to assure that we're offering distributors, designers, installers and homeowners not only innovative technologies - but also fixtures that perform efficiently, install intuitively and deliver a premium source of light. This philosophy holds true for everything we create - from our wide variety of decorative fixtures to our award-winning landscape lighting to our ceiling fans. This is gorgeous in person. Had an electrician install, so can’t speak to ease of installation. Well made and looks high end. Nice bright light. Fan blades have 2sides to choose from, one dark mahogany color, and one side in a dark brown with black fading on the edges. I chose the side with black. Clear seeded glass matches my other lighting choices. Came with wall remote, but I had it wired to a switch. Dimmable. Worth the $. 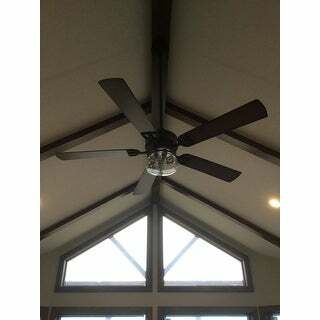 While part of the patio collection this fan can definitely fit in most oversized indoor living spaces. Ordering the matching extension rod as ceilings are very tall. This is a quality fan for outdoor use. It is stylish as well as sturdy. It comes with a wall mounted switch including fan speeds and light switch. We love this fan. 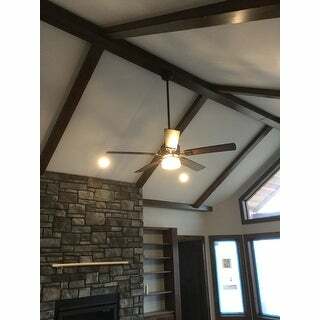 This fan looks just like the picture and it is perfect for a large outside structure. Beautiful! It looks great in our family room. "How far does the fan hang down from the ceiling? How do I order the downrods if needed?" The total fixture drop from the ceiling is approximately 19 inches. The blade drop is 13.25 inches and includes the 4.5 down rod. "Do you sell the downrods that match this fan? Does it come with a downrod?" "can you make longer with a rod"
Yes, there are downrods that range from 12 to 72 inches. Does this come with a downrod?